The streusel or crumb topping for this 8-inch square coffee cake is made with 1/4 cup of oats, just 1 tablespoon each of butter and brown sugar, and a touch of cinnamon. Not a huge standalone cinnamon fan myself (though it has grown on me a lot in the last few years), there is a something about cinnamon in streusel that is so necessary. Even the little guy, who isn't a big fan either, says the cinnamon makes it tasty. It just goes to show that there is a place for everything and that small contributions often make a big impact on the whole! I won't forget the key player: 1/4 cup of chopped toasted hazelnuts. Toasting it is a not a step to skip because it really magnifies the flavor and stretches what you're working with. Making this cake, while simply a manual process that doesn't even require a mixer, does require dirtying a few bowls. After mixing the cake batter, scoop out half a cup of it and stir in some cocoa and milk to make the chocolate layer. Dollop the chocolate batter on top of the plain and give it a bit of a swirl with a butter knife. As I mentioned, I used an equal mix of all-purpose and whole wheat pastry flour for this cake. While I often like to use white whole wheat flour, I think that the finer texture of whole wheat pastry flour works well with cakes. As far as I can tell, the cake certainly didn't suffer from the whole wheat in the mix so I highly recommend it. After baking, the top is nice and golden. Again, you could make a little more crumb topping if you like (I'd stick with the 1/4 cup of hazelnuts and just bump up the rest), particularly if you're serving it to some serious crumb-topping lovers who are looking for it. The final result of the cake itself was probably more of a two-tone or two-layer effect than a marbled cake. I think that has partly to do with me being a little generous in making the chocolate layer (i.e., fear of not having enough chocolate). But in any case, I really liked the contrast and that darker cocoa layer added a subtle flavor that I really enjoyed so it's not just for looks. I'm glad I was drawn to this cake flipping through magazines at the bookstore the other day! Preheat oven to 350 degrees. Grease an 8x8 inch square baking pan with cooking spray and line it with a piece of parchment, allowing for about 2 inches of overhang on two sides (for easy removal later). Lightly grease the parchment paper. Make topping by stirring oats, brown sugar, and cinnamon together in a small bowl. Cut in butter with a fork until mixture is crumbly. Stir in the hazelnuts and set aside. In a medium bowl, whisk flours, sugar, baking powder, baking soda, and salt together. In a measuring cup or small bowl, stir the light sour cream, water, egg, canola oil, and vanilla together. Make a well in the center of the dry ingredients, add the wet ingredients, and stir together until just combined. Remove 1/2 cup of the batter to a small bowl. Stir in cocoa powder and milk until blended. Scrape the plain batter into the baking pan and smooth out the top. It will be a fairly thin layer. Spoon dollops of the chocolate batter on top. Using a table knife, swirl batter slightly to create a marbled effect. Sprinkle the top of the batter with the crumb topping. Bake until cake tester inserted into the center of the cake comes out clean, approximately 20 minutes. Let cool on a wire rack for about 15 minutes, then remove the cake using the parchment overhang. Serve warm or let cool to room temperature on wire rack. The cake can be stored in an airtight container, at room temperature, for about 3 days. To bake as a loaf cake: This cake can be baked in a greased 8x4 inch loaf pan. Place half the plain batter into the pan, followed by half the chocolate batter in small mounds on top. Repeat with another layer of the plain and chocolate batters. Swirl batters slightly to create marbled effect and add topping. Bake for about 35-40 minutes, or until cake tester comes out clean. Let cake cool for about 10 minutes in the pan before removing. I know the feeling. Sometimes I'll see a recipe that I just have to make, even if I'm not sure how it will work. I'm glad this one was a success for you! I agree that crumb toppings make everything better. Most of the time, the feeling is urgent but it gets shoved into a folder and might never happen. I'm glad I did this one though. Thanks, Beth. So glad you like it, Kelly! I think the more marbled effect would happen if baked in a loaf. I really liked this duo layer too. Taste-wise, it's subtle but you definitely taste the cocoa and makes it interesting. Have a great week, my friend. This coffee cake, esp. when topped with that gorgeous streusel, looks right up my alley, Monica. Most of (especially) Asian cooking I can adapt the recipes pretty easily with imagination, but I still struggle with baking recipes. Being afraid of volume by messing up some ingredients and switching the ingredients because I can't tell what could be caused by switching ingredients etc. I guess practice with baking will help to judge what sounds strange and how you can improve etc. It's always fun reading your posts and learn about your experiment - and results always look wonderful!! Thanks, Nami. I do have fun experimenting sometimes but with baking, I don't get too radical. I'm also very much a rule-follower unless it's something fairly "safe" and I feel pretty confident about (so it's usually simple switches). I don't want to waste ingredients! Honestly, I think I just have a much lower standard than you do. haha! I figure my family won't know if it doesn't turn out as good as it should. The close-up photo of the cake slice is lovely, Monica! The lighting makes the top of the cake glow. Close-up you can appreciate the crumb of the cake and the crumble of the topping! This is just the kind of not overly sweet cake that I like with a cup of coffee and any cake with crumb topping is a win for me. :) The photos in magazines often make the food (and purchasing the magazine) irresistible. Sometimes beauty doesn't translate to delicious. I am glad this cake turned out to be as tasty as it is appealing! Thanks, Wendy! Those magazines really draw me in! I am really glad this cake turned out well. I wasn't sure for a few minutes there with those ingredients! I would definitely make this again! Oooh! I just adore chocolate and hazelnuts together. Glad you flipped through magazine and we got to see a beautiful cake. Thank you, Balvinder. I'm glad it turned out so well, too. That is always nice. jazelnut is insanely expensive here in Indonesia and i guess you just made it worth the price my friend! Hazelnuts aren't cheap here but luckily, I can get it in the bulk bins or at discount places for a very reasonable price. They are so full of flavor that a little goes a long way - thank goodness! Yes, yes and yes! 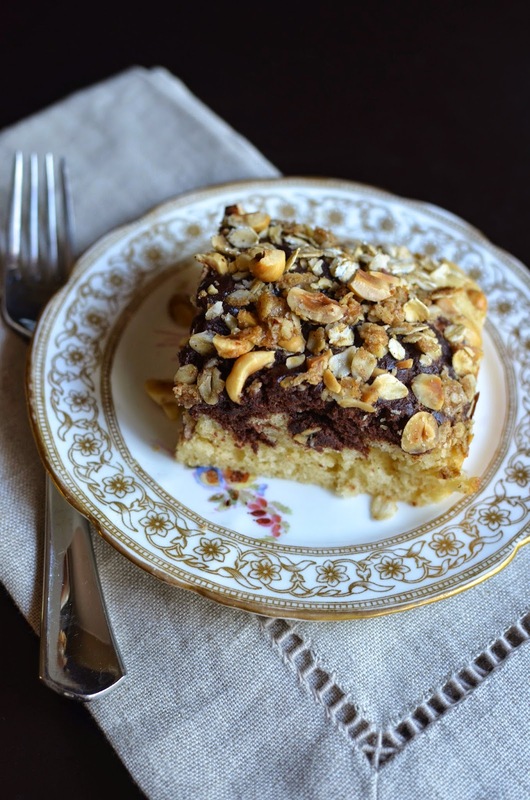 For the chocolate-hazelnut combo, the crumb topping and the marbled base. Seriously, this is like killing 3 delicious birds with one stone. Bookmarking this recipe..have to give this a try. Gorgeous cake and recipe! That's what I was thinking - all those 3 lovely characteristics in one - so I had to try it. It was fun. Thanks, Sonali. Girl you make one mean coffee cake! This looks sensational! This 'coffee' cake is just lovely Monica!! Yes, they are very much underrated, especially here (in the UK). This flavour and texture combination is wonderful - chocolate and hazelnuts!! Yes, definitely under-appreciated...simple and so good. It's a nice change up from muffins. Absolutely...the pictures are fun to look at and the styling is inspirational, too. The toasted hazelnuts in that topping sound so amazing! This coffee cake is beautiful Monica! It packs a lot of flavor so you can do light on the rest of the sweet topping. Thanks, Jessica! You know that is something that I have not done in a long time s browse through a book store with actual cookbooks. I also love thumbing though the books and the photos. It really is all about the photos isn't it and speaking of that just love your photos of this delicious crumb topping cake. I love strussel toppings.All we need to do now is put on the kettle. Have a super day. Yes - someone put on the kettle! Love the sound of that. Thanks, BAM! 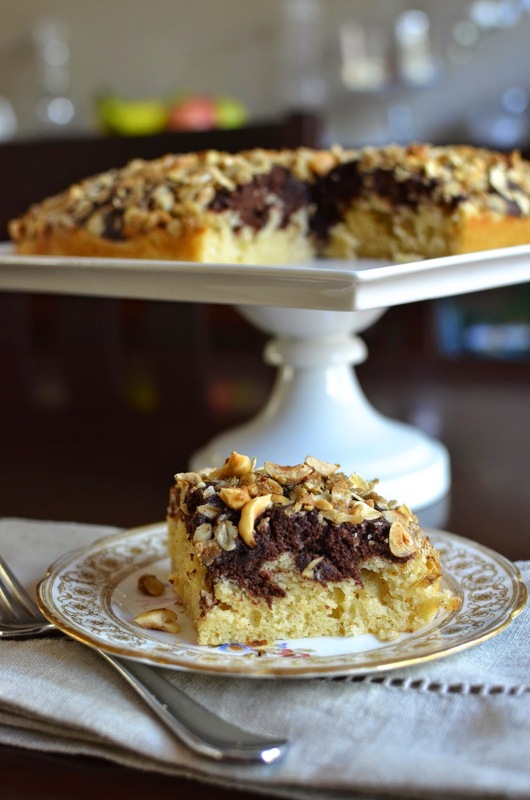 This is such a beautiful cake Monica...I love the marble and yes the crunchy toasted hazelnut on top just look delicious! Things are good, thanks Juliana! Mmmmm I love the marble look and the hazelnut crumb topping. Brilliant. I love marble cakes, too...not a lot more work but seems so special and retro. Coffee cake and a cup of coffee while leafing through a pile of cooking magazines would be perfect!! Believe me...most of the time, I am in the same boat. I find that if I wait a few days, the "urgency" often fades. Life gets in the way and honestly, there are just so many things to cook and eat. It's impossible to do it all!